Many, many years ago, I received a bad photocopy of this solution. I have transcribed the text, created the images anew, Americanized the text from the British version, and basically plagiarized it to make a nice, readable web page (although this same solution is widely available in various locations). By way of atonement for the copyright violation which I am sure I am committing, I urge you to find and buy a copy of David's booklet, if it is still in print. UPDATE! David Singmaster's book can be found at www.scribd.com/doc/80491513/Notes-on-Rubik-s-Magic-Cube and at www.amazon.com/dp/0894900439. The notation is the same as given in section 3 of my "Notes on Rubik's 'Magic Cube'". Some familiarity with section 3, with cycles and even permutations (section 4) and with the basic processes P1, P2, P3, P4 and conjugation (section 5) will help you to understand this method, but you can apply this solution without any of this knowledge. You may want to practice the individual steps of this method separately before trying to restore the cube completely. It is especially easy to see what is happening if you start with the cube correct, either by taking it apart or by getting (bribing?) someone to do it for you. 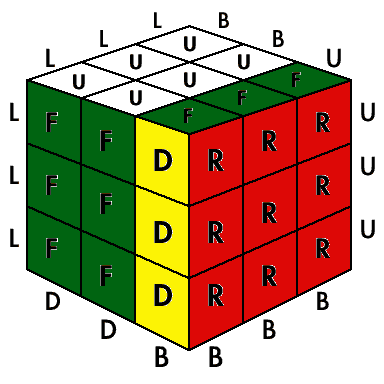 The six faces of the cube are labeled Right, Left, Front, Back, Up, Down and are abbreviated to their initials R, L, F, B, U, D. The centers of the faces will remain fixed in space during each substage, so we always know which color is R - namely the color of the center of the R face. Pairs and triples of letters will define both positions and pieces, as in figure S1. eg. 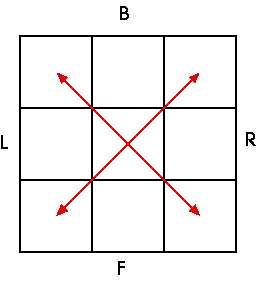 UF is the edge between the U and F faces, URF is the corner of the U, R, and F faces. At the beginning, each piece is in its correct position (or place), but they soon move about. We will say UF is at RB if the UF piece is at the RB position with the U side of UF in the R face. 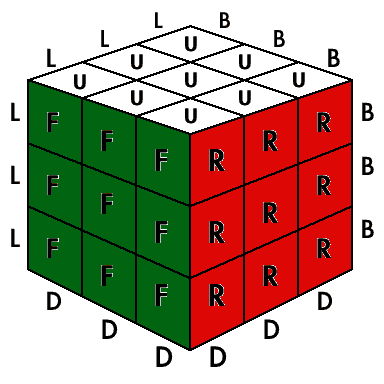 The letters R, L, F, B, U, D are also used to describe turns of the faces of the cube. eg. 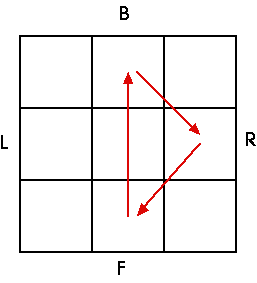 R is a 90° clockwise turn of the R faces, as shown in figure S2. Note that DFR is now at FUR, DR is at FR, etc. Each face rotation is takes 90° clockwise as viewed when looking at the face from outside the cube. R2 will denote a 180° turn (in either direction!) and R' will denote a 90° counterclockwise turn of the R face. eg. to correct figure S2, we will want to apply R'. A sequence of moves, such as RUF means apply first R, then U, then F. Note that RR = R2, RRR = R3 = R', RR'=R'R is the process of doing nothing. The first three stages are described for one piece but each must be applied four times with the whole cube turned 90° between applications. The descriptions are for the hardest cases. With practice you will be able to do the earlier applications much more efficiently. Let us suppose that we want to put the UF edge piece into its proper place. First, find the piece. We shall describe how to get it into place without disturbing any other U edges. But if UF is already somewhere in the U face, we first move it off the U face by turning the side face which contains it. So we have the UF piece not in the U face. 1.a. if UF is in the D face with its U side down, then turn D until UF is in the F face and apply F2. eg. if UF is at DB, apply D2F2. 1.b. If UF is in the D face with its F side down, then turn D until UF is in the F face and apply F'U'RU. eg. if UF is at BD, apply D2F'U'RU. 1.c. If UF is in the middle layer, then it can be rotated into the U face by either of two side turns. One of these side face turns would put the U side of UF in the up direction. First turn the U face so that the UF *position* is in this side face, then turn the side face and then turn the U face to put the UF piece in place. eg. if UF is at RB, apply U2BU2, while if UF is at BR, apply U'R'U. You should now have a correct pattern of U edges. Put U corners correctly in place. Let us suppose that we want to put the URF corner piece into its proper place. First find the piece. We shall describe how to get it into place without disturbing any U edge or any other U corner. But if URF is already somewhere in the U face, we first move it off the U face by turning a side face that contains it, then applying D2 and then turning the side face back. (It is easier if you ensure that the U side of URF does not go down.) So we have the URF piece in the D face. Now turn the D face so that our piece is at the FRD corner. You should now have a solid U colored U face with its sides agreeing with the side face centers. Now turn the whole cube over so the correct face is now down (ie. D). It will remain D through the rest of the method. Put middle layer edges correctly in place. Let us suppose that we want to put the FR edge piece into its proper place. First find the piece. We shall describe how to get it into place without disturbing the D face, or any other middle layer edge. 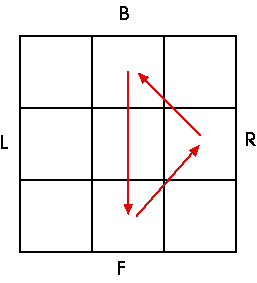 But if FR is already somewhere in the middle layer, we move it into the U face as follows: turn the whole cube so that the offending piece is at the FR position, apply B'U·R2U2R2U2R2U2·U'B (which moves the piece to BU), then turn the whole cube to where it was. So we have the FR piece in the U face. You should now have the bottom and middle layers correct. An even number of U sides of U edges will now be up. By turning the cube, you can apply one of the following. 4.a. If the pieces at UB and UF are incorrectly oriented, apply B·LUL'U'·B'. 4.b. If the pieces at UB and UL are incorrectly oriented, apply B·ULU'L'·B'. 4.c. If all four pieces are incorrectly oriented, apply 4a, turn the cube 180° and apply 4a again. You should now have a + pattern of U edge faces in the U face. Make the U edges into an even permutation. Examine the 4 U edge pieces and compare their side faces with the side face centers. Turn U so that UF is at UF. If a total of two edge pieces are now in their proper places, apply U. You should now have 0,1, or 4 U edge pieces in place. Put U edges in place. 6.a. In one case out of six, the U edges are now all in place. Do nothing. 6.b. In four cases out of six, there will be just one U edge correctly in place and the other three want to be cycled. Turn the cube so the correct piece is at UL. 6.b.i. 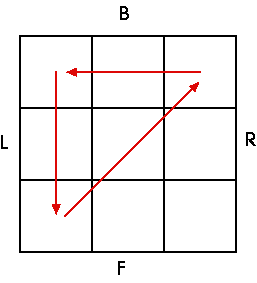 If the three U edges want to be cycled clockwise, as in figure S4, apply R2D'·U2R'LF2RL'·DR2. 6.b.ii. 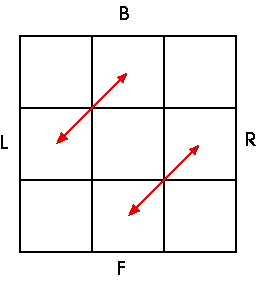 If the three U edges want to be cycled counterclockwise, as in figure S5, apply R2D'·R'LF2RL'U2·DR2. 6.c. In one case out of six, there will be no U edge pieces correctly in place and two adjacent pairs of edges want to be exchanged. Turn the cube so you want to exchange UF with UR and UL with UB, as in figure S6. Apply R2D2B2D·L2F2L2F2L2F2·D'B2D2R2. You should now have all the U edges correctly in place. Put U corners in place. 7.a. In one case out of twelve, the U corners are now all in their correct places, though perhaps disoriented. Do nothing. 7.b. In eight cases out of twelve, one U corner is in its correct place, though possibly disoriented, and the other three want to be cycled. Turn the cube so the correctly placed piece is at the URF corner. 7.c. In two cases out of twelve, there will be no U corners correctly placed, and there will be two pairs of adjacent corners that want to be exchanged. 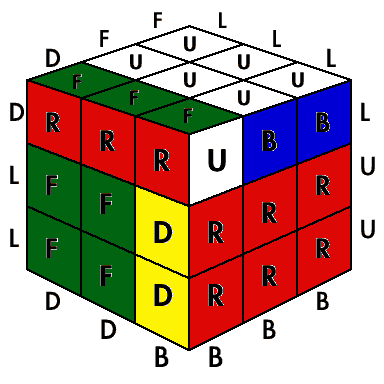 Turn the cube so the exchanges are along the UF and UB edges of the cube, as in figure S9. Apply B·LUL'U'·LUL'U'·LUL'U'·B'. 7.d. 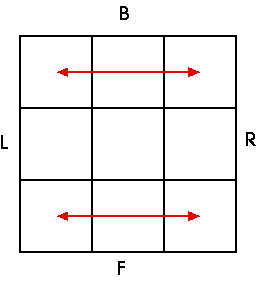 In one case out of twelve, there will be no U corners correctly placed, and the two diagonal pairs of corners want to be exchanged, as in figure S10. Apply R'B2·FRF'R'·FRF'R'·FRF'R'·B2R. You should now have all the U corners in their correct places, though possibly disoriented. Turn the cube so some incorrectly oriented U corner piece is at the URF position. 8.a. If the piece at URF wants to be twisted clockwise (viewed from outside the cube), apply FDF'D'·FDF'D'. 8.b. If the piece at URF wants to be twisted counterclockwise, apply DFD'F'·DFD'F'. This should make the piece at URF be oriented correctly, though it temporarily confuses the rest of the cube. Now turn *just the U face* to bring another incorrectly oriented U corner piece into the URF position. Apply 8a or 8b as needed. Continue in this way until all U corner pieces are correctly oriented. You will then need to turn the U face to bring UF back to the UF position and the cube should now be completely correct! Scream HOORAY!! Buy a round of drinks. Send [David Singmaster] a check. Tell the orderlies that they can let you out now. Etc. etc. The following paragraph is dated, but included to preserve the original context. If you have obtained this solution without the entire booklet, you will now undoubtedly want to purchase your own copy of the "Notes on Rubik's 'Magic Cube'". The Fifth Edition, of which this solution is a part, is now available. It includes an analysis of the possible patterns that you can get on the cube, including an informal proof that the above method will always work. catalogues of the known pretty patterns and short methods of achieving results, anecdotes, eg. about "Cubist's thumb" and Conway, who does the cube with only five looks at it, the best know methods (52 moves at most), the best known times (36 seconds) to restore a cube, the conjectured length of God's algorithm, Thistlethwaite's tritwist, and much much more. A superb introduction to mathematics for those who never liked it. Now expanded to 75 pages! Bigger and better than ever. An American edition will soon be ready.